Reporting on new discoveries regarding the Black Hawk War in Utah. since 1989 historian Phillip B Gottfredson has devoted his time and resources to nearly two decades of research. The inaccuracies in Utah's history, as they pertain to Utah's Native American inhabitants, reservations, treaties, tribal identity, and Native relations with early Mormon pioneers, must of neccesity be corrected now or never. 2018 was a banner year for The Black Hawk War; Utah's Native American history website. We spent hundreds of hours improving the performance side of things, and the results have been staggering. Google reported our visits have increased as much as 1600% over the previous year! That means we are reaching a much broader audience. Moreover, Mr. Gottfredson added a lot of new material and spent considerable time rewriting old material. Our content is more accurate and in-depth than before. Our addition of the Black Hawk War Timeline page has been a great hit with our followers who are students, teachers, and historians, enabling greater access to all the material we have accumulated over the past 20 years of research. 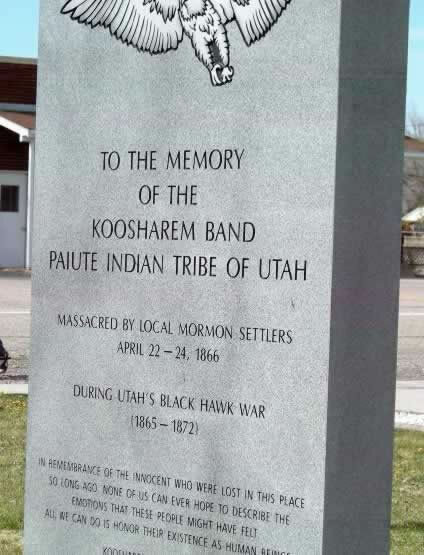 More importantly we have been consistent in our primary goal being to educate people about the Black Hawk War in Utah from the perspective of Utah's Native American peoples who were most affected by this monumental tragedy in American history. We have through our efforts corrected key aspects of Utah's Black Hawk War history and are seeing other related websites following suit. One example is Wikipedia where we have seen significant changes, most important is the Timpanogos Nation. When we introduced the Timpanogos as having played a major role in Utah's Black Hawk War there was much skepticism among our followers. Because we backed our claim with documentation provided by Mary Meyer Chief Executive of the Timpanogos Nation our claim stood strong against opposing points of view. We are confident our work will continue to stand the test of time and bring a much needed and unique perspective to Utah's history. We are looking forward to another great year, and a sincere THANK YOU to all our loyal fans! Update 10/22/2018 It appears Google has heard our complaint and corrected Colorow's photo being labeled as Walker. How many times have you heard TV, Radio, Newspapers, and even court documents say or use the term "Uintah Ouray Reservation?" Well, did you know the fact is the Uintah Ouray Reservation is non exist ant. "The Ute Tribe of the Uintah & Ouray Reservation" is only a constitutional name NOT A RESERVATION and never was a reservation." Black Hawk Productions has recently added a new page to it's website titled "Utah's Timpanogos Are Snake-Shoshoni; No relation to Utes." And on this page Black Hawk War Historian Phillip B Gottfredson talks about the Uintah Ouray Reservation as never being ratified by Congress and therefore does not exist. The following is an excerpt from that page. "The Northern Ute Tribe of Utah is a federally recognized Tribe. The "NORTHERN UTE TRIBE" wasn't created until 1937, under the constitutional name "Ute Tribe of the Uintah & Ouray Reservation". The "Ute Tribe of the Uintah & Ouray Reservation" is only a constitutional name NOT A RESERVATION and never was a reservation. Congress is the only one that can create a reservation, and there is no congressional act that created any reservation called the " Uintah & Ouray Reservation." The Northern Ute Tribe lives on the Uintah Valley Reservation as does the Timpanogos Tribe. The Executive Order signed by Abraham Lincoln in 1861 that created the Uintah Valley Reservation does not make any mention of the "Uintah Ouray Reservation" and/or make any reference to the "Utes" or Ute Indians of Colorado or "Confederated Utes of Colorado" what-so-ever. What President Abe Lincoln said was "that the Uintah Valley, in the Territory of Utah, be set apart and reserved for the use and occupancy of Indian Tribes of Utah." Signed by The President Abraham Lincoln Executive Office Oct. 3, 1861, with the Presidents words "Let the reservation be established, as recommended by the Secretary of the Interior." It was then enacted into law on May 5, 1864, by Act of Congress. In 1886 then-President Chester Arthur by Executive Mansion (same as Executive Order) designated a small strip of land on the Uintah Valley Reservation for the "temporary" use by the Colorado Utes at the Uintah and Ouray Agency to graze their cattle, which is today known as Ouray. President Arthur's Executive Mansion order did not abrogate or diminish the Uintah Valley Reservation. And in a recent 10th District Court ruling July 2017, the court said that the Uintah Valley reservation has never been abrogated or diminished and remains intact." Why the Uintah Valley Reservation is being called the Uintah Ouray Reservation remains a mystery. Learn more at Utah's Timpanogos Are Snake-Shoshoni; No relation to Utes. Efforts to help correct Utah's inaccurate Native American history and bring attention to the Timpanogos Nation has begun to take hold on the internet. Needless to say, I went into my defensive mode, after all I had invested more than a decade researching the Black Hawk War, “what do you mean I have the wrong Tribe” I responded. “Haven't you ever heard of the Timpanogos” Mary asked? Puzzled I said, “well... yes, maybe, aren't they Ute?” During that phone conversation Mary Meyer said enough to convince me it was probably a good idea I speak with her in person. We met at a mutual friends home in Salt Lake, and what was supposed to be a hour meeting turned into four years and one of the greatest highlights in my life. As Mary has patiently educated me on a little known Tribe that history has marginalized. Or, to put it more succinctly, the Mormon church and it's historians have buried under a mountain of half-truths, ambiguities, platitudes, and omissions. Upon getting acquainted with the Timpanogos peoples, the first thing I offered them was that I wanted to build them a website free of charge. It took a month to build it, and we launched Timpanogostribe.com in July of 2014. Since then we have watched it propagate the internet with surprising results. In 2014 a search for 'Timpanogos Indians' would result in hundreds of pages regarding Mount Timpanogos, and everything else associated with Mount Timpanogos, except the Tribe, from whom the mountain gets it's name. That has changed, and the Timpanogos Tribe of a thousand people, finally have a voice. Of coarse I had to rewrite all 83 pages of my website replacing the word 'Ute' with Timpanogos. And now with two websites on the internet about the Timpanogos, we are seeing the name 'Timpanogos' everywhere. Not only that, many other sites we see are correcting their stories about the Black Hawk War and also replacing 'Ute' with... you guessed it, the Timpanogos Tribe! Just a few days ago the Tribe updated their news page, and you should take a look at . And while you're there take a look around at their history etc., if you haven't already. In closing I just want to say, for the past four years I have been spending all my summers with Mary and her people here on the Uinta Valley Reservation. Same as my great-grandfather did. He spent much of his time living with the Timpanogos and during the Black Hawk War. And now I understand why he too loved being with them.